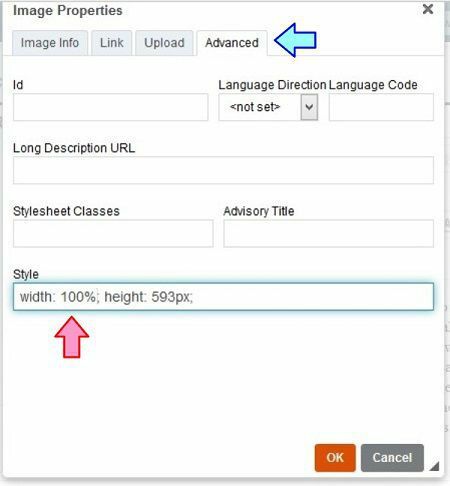 When you add an image to your website using DSS, you may want to extend it the entire width of the page. This is a common practice used by web designers because not all images fit properly in the website space. You may want to stretch an image for aesthetics; because you want the image “blown up” to appear in a much larger size; or because you want the image to appear as a banner at the top of your page. Extending an image in this way can be an effective way to draw the reader’s eye to an important visual that complements your content. Because stretching an image can sometimes distort its appearance, you want to retain the appearance of the photo, illustration, or image in its initial form. Step 1: Evaluate if your image is big enough to stretch across the website page. You need to size the image to fit before you upload it to DSS. The standard width for a two-column site is 640 pixels (px) wide, and 980 px for a single column site. If you need help with resizing, read through our instructions on this process. Step 2: Log into DSS, and display the content where you want the image to be added. Step 3: Once the desired content displays, click the location where you want to insert the image. In the example below, the cursor is placed at the front of the first sentence. Step 4: To select the image you want to place, click the Image icon under the Rich Content Editor heading. This icon is designated by a picture of a mountain. If you mouse over the icon, the word “Image” displays. Step 5: Click the Browse Server button next to the URL box. Step 6: Click the Upload icon at the top of the window. Step 7: Navigate to the location of the image saved on your computer, and double-click it. Step 8: Once the image uploads into the Image Properties dialog box, choose the Advanced tab. Step 9: In the Style field, type width: 100%. Step 10: Click the orange OK button. Your image is stretched across the website page without distortion.